Prayerfully journey through Lent with Mary DeTurris Poust's fresh and meaningful reflections on the daily Mass readings. In just minutes per day, the insightful meditations of Not by Bread Alone can deepen your experience of this solemn season of prayer and penance and prepare you to participate more fully in the joy of the great Easter mystery. Mary DeTurris Poust is a writer, retreat leader, and the author of numerous books on Catholic spirituality, including Waiting in Joyful Hope: Daily Reflections for Advent and Christmas 2017-2018. She writes about the spiritual journey on her blog, Not Strictly Spiritual, and in her monthly column, Life Lines. She is also director of communications for the Diocese of Albany. She lives in upstate New York with her husband, Dennis, and their three children. Visit her website at www.NotStrictlySpiritual.com. Some years we approach our Lenten disciplines with a sense of enthusiasm; we're ready for the challenge of the desert; we know we will emerge stronger for our time spent thirsting, climbing, and stepping forward in faith. In other years, we may look at Lent with wary eyes, all too familiar with the weight of our faults, and daunted by the bright empty heat into which we must carry them, until we find Jesus, to whom they may be surrendered. Whether you are anticipating Lent as an adventure to be embraced or as a scorching sojourn made in heat and light, Not by Bread Alone is the perfectly balanced Lenten companion for your daily contemplation. If you have ever fallen short of your Lenten resolutions, take this book with you wherever you go this Lent! 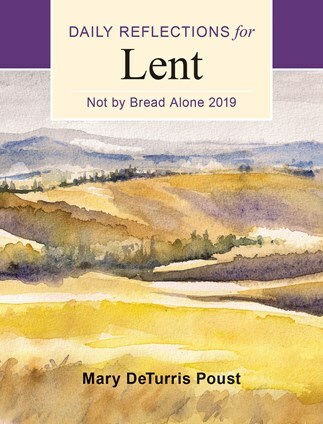 Whether waiting at a doctor's office, silently sitting outdoors during your lunch break, or deliberately spending time with Jesus at Adoration, Mary DeTurris Poust's insightful words in Not by Bread Alone will walk you through each day's Scripture readings, helping you reflect and meditate on the graces waiting for you during this beautiful season of Lent. Day by day, moment-by-moment, this Lent can, and will, be different.